Part One of this series focused on the role of quantity in contested ship-to-shore movement. Read it here. The age of battleships laying broadsides into beaches may have been over when the USS Iowa was decommissioned, but the increasing threat of anti-ship missiles and A2/AD may draw a curtain on the modern surface combatant doing likewise. 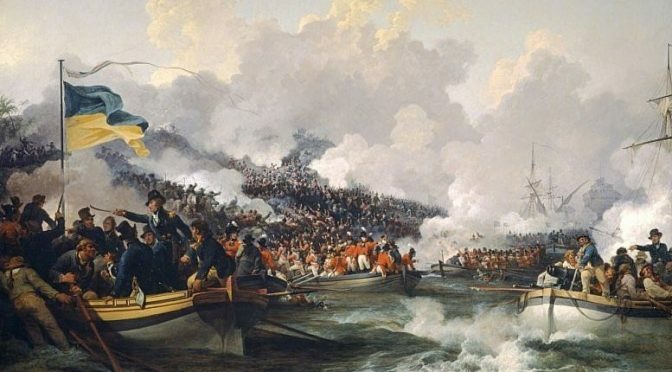 For a contested ship-to-shore movement to be successful at the shore overmatch is required at the landing zone both in terms of quantity of troops and firepower. Unable to conjure enough firepower out on the beach due to obvious constraints, extensive supporting firepower must come from the air and the sea. In any case accurate fire support is vital and in high demand. 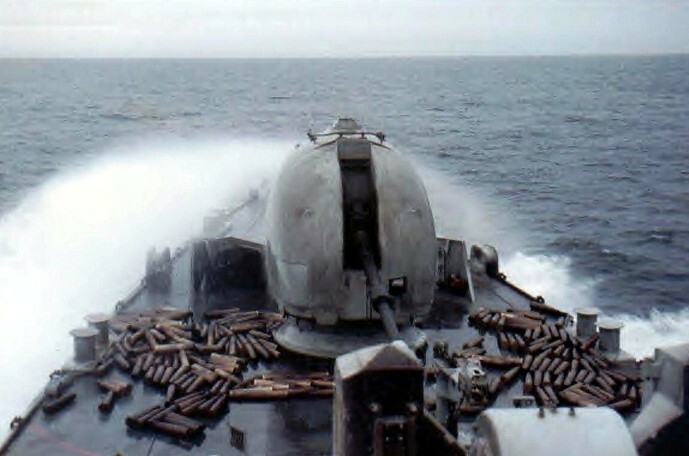 Naval gunfire support played a considerable role in Vietnam and particularly in the Falklands, enabling small British units to combat larger Argentine forces.7 However, the transition from gunfire to missiles as the default weapon of modern ships decreases the availability of fire support. Navies are unlikely to fire expensive munitions such as a Tomahawk missile to destroy a machine gun emplacement or a vehicle, whereas gunfire can be brought to bear on numerous targets of opportunity. Ships also carry limited numbers of land attack missiles due to the need to maintain a diverse inventory of missiles for a variety of multi-domain threats. In a contested theater one would also be loath to expend many Tomahawks on minor land targets a short distance away. Land attack missiles may be able to carry some of the burden for amphibious troops, but if fired at a great distance out to sea the long flight time for subsonic missiles is hardly ideal for troops in contact.11 These cruise missiles would also likely need some form of in-flight retargeting support to ensure their precision. Airpower to an extent has filled the vacuum gunfire or cruise missiles cannot. In the Falklands campaign for example, airstrikes from Harrier jets helped make up for the lack of gunfire support.11 However, air defense systems have become increasingly sophisticated and potent. As they will continue to grow in capability and proliferate amongst state and non-state actors, aircraft operating in A2/AD environments will be restricted to more advanced platforms.12 Rotary wing aircraft could be of little value if their ships have been forced out to sea by anti-ship missiles since the combat radius of many rotary wing attack aircraft is around 120 nautical miles.13 Instead, viable firepower support will be best provided via tube artillery, rockets, or cheaper missile systems that can operate closer to shore. Such craft will also require point defense systems for survivability. This is a necessity to provide survivability for ship-to-shore connector because one can expect increasingly precise artillery and rocket systems. Laser-guided munitions capable of striking moving targets and top attack munitions such as the BAE Bofors 155 BONUS or SMArt 155 will be capable of significant devastation. It is conceivable that counter-battery fire can be swapped between defending land-based artillery and ships providing fire support for an invading force as artillery grows more precise. Once visible on the horizon direct fire systems like anti-tank guided missiles can target landing craft and their fire support assets. Thus, hard and soft counter rocket, artillery, and mortar (C-RAM) systems, air defense, and active protection systems like Trophy will need to be equipped by both connectors and the vessels providing their fire support. 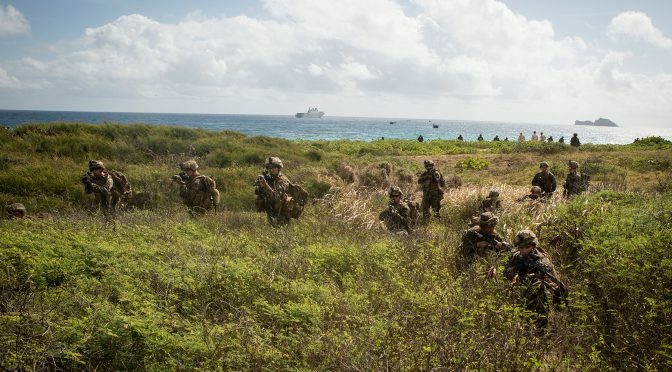 Transit times to the shore will place both under fire for considerable lengths of time and sustaining close fire support for an amphibious force will be highly risky. In an A2/AD environment ship-based fire support may often be limited to the unattractive option of cruise missiles given current capabilities and threats. Cheaper long-range missile and artillery systems will need to become more available in order to provide the requisite fire support to develop overmatch. 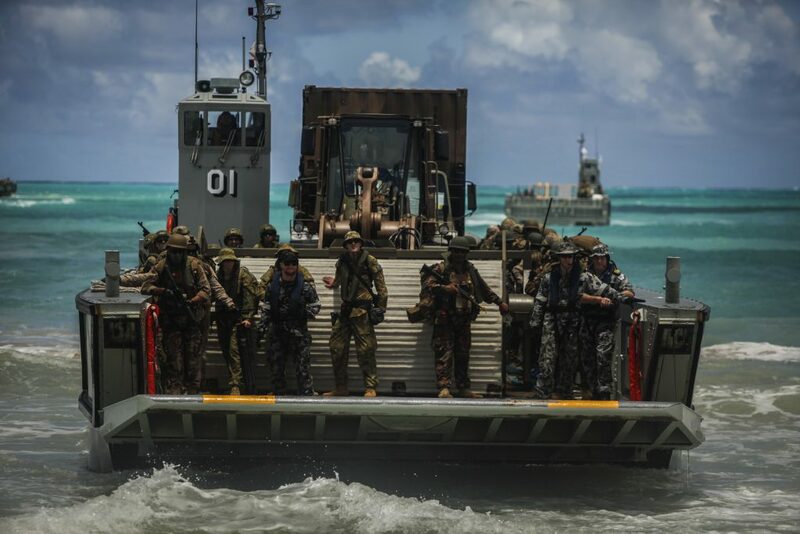 One potential solution is the utilization of cheaper gun and missile boats that can be risked close in to shore to provide fire support and to project an area of point-based air defense around the approaching landing craft to increase survivability. 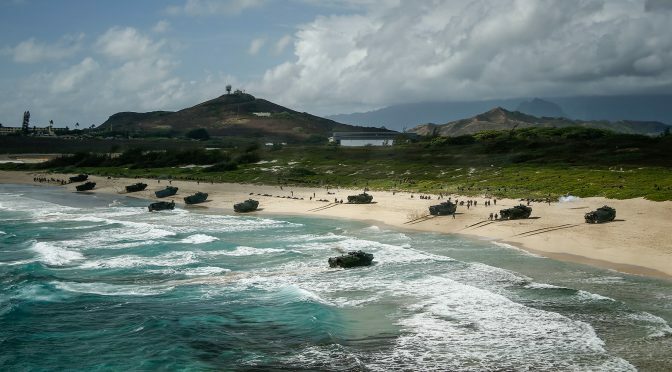 In any case amphibious flotillas will require plenty of firepower and protection so as not to be disabled before arriving on the beach, but providing fire support against modern threats involves complicated and frequently unfavorable tradeoffs. Andrew Feickert, Marine Corps Amphibious Combat Vehicle (ACV) and Marine Personnel Carrier (MPC): Background and Issues for Congress (Washington, DC: Congressional Research Service, 2018), 6. Bryan Clark and Jesse Sloman, Advancing Beyond the Beach: Amphibious Operations in an Era of Precision Weapons (Washington, D.C: Center for Strategic and Budgetary Assessments, 2016), I.
 Carlo Kopp, “Proliferation of Advanced Air Defence Systems,” Defence Today (2010): 27. “Surviving the Modern Integrated Air Defence System”, Carlo Kopp, Air Power Australia, 2009, accessed, July 1, 2018, http://www.ausairpower.net/APA-2009-02.html#mozTocId418713. Jeff Harrigan and Max Marosko, “Fifth Generation Air Combat Maintaining the Joint Force Advantage”, JAPCC Journal 24, spring/summer (2017): 54. “Hezbollah” Missile Defence Advocacy Alliance, accessed June 30, 2018, http://missiledefenseadvocacy.org/missile-threat-and-proliferation/todays-missile-threat/non-state-actors/hezbollah/. 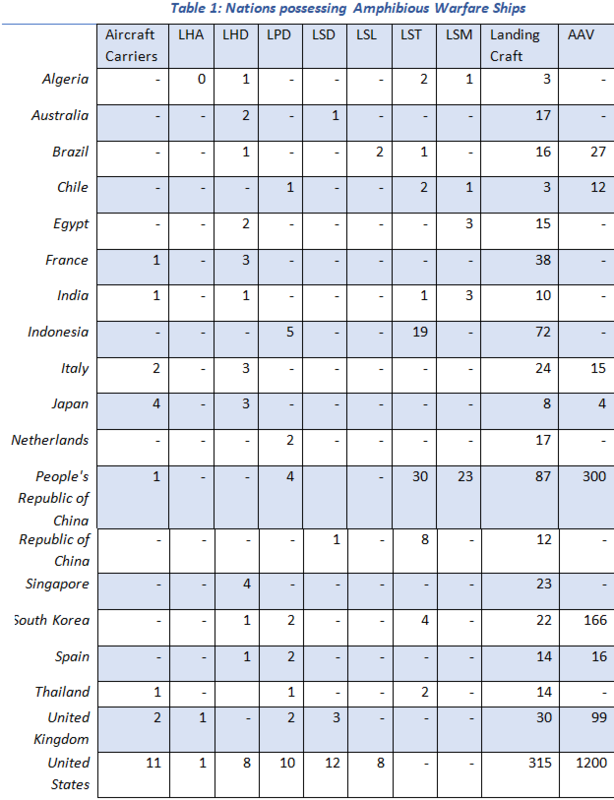 Office of the Secretary of Defense, Annual Report to Congress: Military and Security Developments Involving the People’s Republic of China 2015 (Washington, DC: Office of the Secretary of Defense, 2015), 10. “For Want of a Broadside: Why The Marines Need More Naval Fire Support,” Vince DePinto, CIMSEC, accessed July 3, 2018, http://cimsec.org/want-broadside-marines-need-naval-fire-support/31347. Carter A. Malkasian, Charting the Pathway to OMFTS A Historical Assessment of Amphibious Operations From 1941 to the Present (Virginia: CNA, 2002), 41. 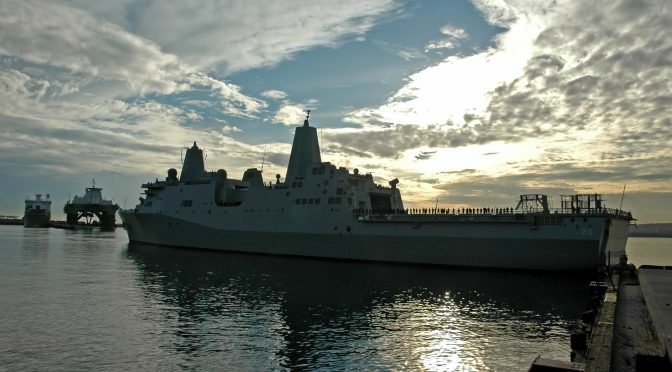 “Navy Planning on Not Buying More LRLAP Rounds for Zumwalt Class,” Sam LaGrone, USNI News, accessed July 14, 2018, https://news.usni.org/2016/11/07/navy-planning-not-buying-lrlap-rounds. Chief Technical Officer, Program Acquisition Cost by Weapon System (Washington, D.C: Office of the Under-Secretary of Defense, 2017), 63. Michael Craig Harris, Is Tube Artillery a Viable Fire Support Platform for the United States Military on the Battlefields of the Future? (Alabama: Air War College, 2017), 22. “XM 982/Excalibur,” BAE Systems, accessed July 16, 2018, https://www.baesystems.com/en/download-en/20151124114142/1434555562238.pdf. Peter J., “XM1156 Precision Guidance Kit (PGK) Overview,” Burke and Anthony Pergolizzi, Fuze Conference, accessed July 19, 2018, http://citeseerx.ist.psu.edu/viewdoc/download?doi=10.1.1.386.3598&rep=rep1&type=pdf. Earl H. Tilford, “Air Power Lessons,” in Military Lessons of the Falkland Islands War: Views from the United States, eds. Bruce Watson and Peter Dunn (Colorado: Westview Press, 1984), 45. Carlo Kopp, “Proliferation of Advanced Air Defence Systems,” Defence Today (2010): 27. “Surviving the Modern Integrated Air Defence System”, Carlo Kopp, Air Power Australia, 2009, accessed, July 1, 2018, http://www.ausairpower.net/APA-2009-02.html#mozTocId418713. Harrigan and Marosko, “Fifth Generation Air Combat Maintaining the Joint Force Advantage,” 54. “Mk 45 Mod 4 Naval Gun System,” BAE Systems, accessed July 20, 2018, https://www.baesystems.com/en/product/mk-45-mod-4-naval-gun-system. John Matsumura, Randall Steeb, and John Gordon IV, Assessment of Crusader: The Army’s Next Self-Propelled Howitzer and Resupply Vehicle (Santa Monica, CA: RAND Corporation, 1998), 10.